Loving our new Lensbaby Composer Pro Lens!! Berries... sweet, juicy berries. Truly a summer treat, are they not? I will admit to hounding my favorite farmer's market vendor as to when my beloved raspberries will arrive, but so far I've had to "settle" for the sweet, perfectly red, ripe organic strawberries. Not much of a sacrifice, if I do say so myself. With these beautiful berries, I usually serve them unadorned, cut into a bowl, or even simply eaten out of hand. 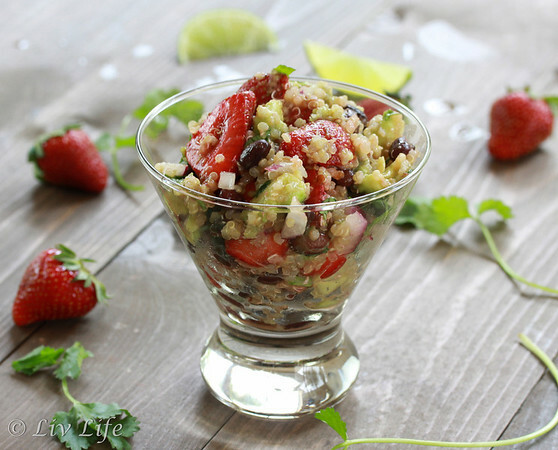 However this year I've stretched, and put them into muffins, even a pie, and now this fabulous, savory quinoa salad which we prepared for Wendy, The Weekend Gourmet's, new Monthly Salad Bar Club (this month's challenge is to include berries). 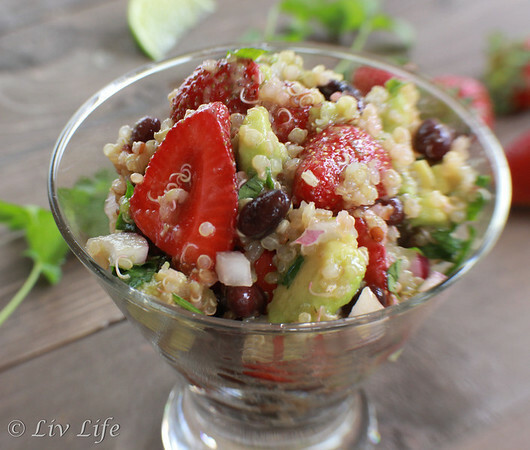 With the perfectly ripe berries, this salad came together better than I had expected, including a shot of lime juice and zest that brought the flavors singing to a new level. Sweet, savory and protein packed with quinoa, this salad filled my lunch plate and had me returning for more. Lensbaby Macro Converters get you close! Quinoa has been my go-to ingredient of late due to its high protein punch and nutrient value. A native to the Andean regions of Peru, quinoa is truly an "ancient grain" (though it is in reality a seed) with a near 9,000 year history. 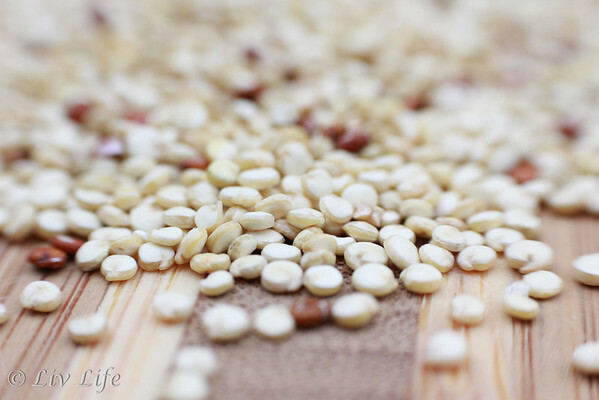 Once called "The Gold of the Incas", quinoa is not just high in protein, but a complete protein, meaning it contains all 9 essential amino acids. In addition to protein, the tiny seed is a very good source of manganese as well as a good source of magnesium, folate, and phosphorus, potentially making quinoa valuable for persons with migraine headaches, diabetes and atherosclerosis. Adding antioxidant-rich strawberries to the mix has this salad's nutritional benefits reaching for the stars while the flavor alone is something you can be proud to serve. Thanks to Wendy for stretching my salad recipe and for starting the Salad Bar Club. Want to join too? Head over to the Salad Bar Club Facebook Page and become part of the team! Next month we bring you Pot Luck Salads, stay tuned. Sweet and savory in addition packing a nutritional punch, this salad works perfectly for a light lunch or a dinner side. The lime brought an unexpected flavor peek that I simply can't get enough of! One of those versatile recipes, increase the ingredients you love to suit your tastes. Add all ingredients to a medium sized bowl and mix gently. Taste and adjust seasonings and ingredients as desired, chill and serve. Liv Life Note: I've made this salad 3 times, each time with different proportions. Add extra quinoa if desired, but note that you may need a bit more lime juice and olive oil. While I enjoyed the black beans, they were not a favorite with my husband, feel free to leave them out if you like. Love your creative salad...I really need to jump on the quinoa bandwagon. I think I'd love it, but need to take the plunge. California strawberries are truly the best! I am always looking for recipes to add quinoa too. This looks amazing! I was seriously contemplating a quinoa salad, as well, but didn't wind up making one. Looks like I'll have to make up for that soon...this is calling my name! Kim, I was so excited to see a quinoa salad in the linky queue...and when I realized it was yours, I was ecstatic! If I get my act together, it will be my lunch all week long! LOVE it! My family has fully embraced quinoa, so I bet they'd like this salad. This looks divine. 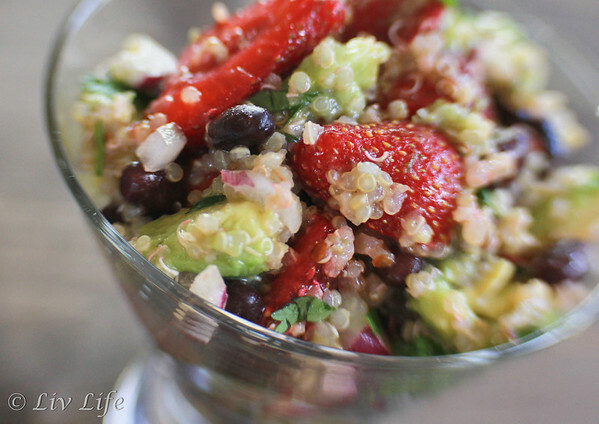 I love avocados, strawberries, and quinoa, but have never put them all together. I have to make this soon. Qunioa is an inspired choice here! I love that you included it in your salad - quinoa is GREAT with sweet things. I would have never put this all together, but this sounds delicious. A perfect summer meal in itself! I love adding quinoa to a salad. Yum! I love quinoa! It is like my go to grain. I like replacing pasta and rice with it. I love this salad too! Who would have thought to put black beans and strawberries together!? So unique! What a great salad!!! Great combo of flavors! 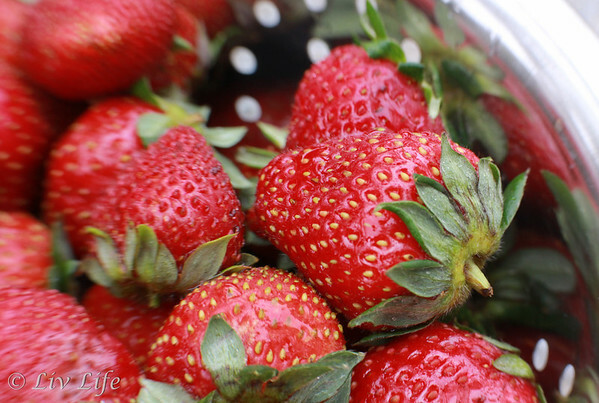 I just picked up a pound of strawberries...they are so good right now! Thank you for sharing this beautiful recipe with us. I'm always looking for more ways to add quinoa to our diet! You've put so many of my favorite ingredients together! This looks wonderful, perfect for a delicious summer supper! I'd love it with some grilled chicken, yum! OMG, this looks soooo good! Will definitely be trying it soon!